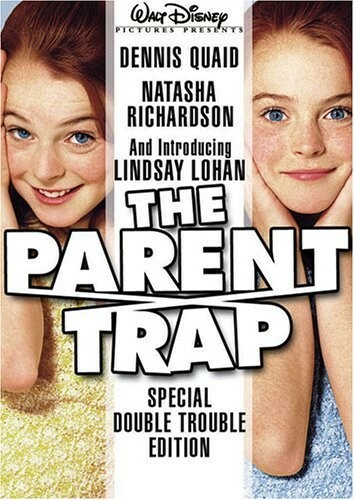 What makes the Special Edition of The Parent Trap so cool isn't just that you get to enjoy Lindsay Lohan's amazing theatrical debut, but that's it's filled with bonus materials you've never seen before. Hallie Parker, a hip Californian, and Annie James, a proper London miss (both played by Lohan) are identical twins who don't even know each other exists -- until they accidentally meet at summer camp. Now they're up to their freckles in schemes and dreams to switch places, get their parents (Dennis Quaid and Natasha Richardson) back together, and have the family they've always wished for! If you were a kid in the early 1960s, then you saw The Parent Trap with Hayley Mills--it's as simple as that. Now Disney has pulled the beloved comedy--about a pair of twins who meet for the first time at summer camp and vow to reunite their long-divorced parents--out of the mothballs and remade it with a decidedly '90s feel. This time, the twins act is performed by newcomer Lindsay Lohan, who plays both Hallie and Annie, who each live with one of their parents (Dennis Quaid and Natasha Richardson). Adversaries when they first meet at camp, Hallie and Annie become, well, sisters when they figure out that they are siblings.